Charles Taylour’s 1688 booklet recording his strange adventure and the St. Edward’s University yearbook, The Tower, from which the Westminster Abbey artwork which illustrates this story was taken, inspired my research associated with St. Edward and the school colors. 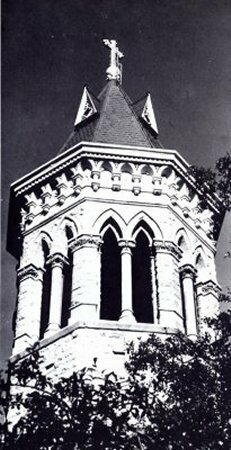 The two photographs shown here of, The Tower, and a Brother at the stained glass doors at St. Edwards University were also taken from this same 1966 Yearbook. Had my neighbor, whose son went to St. Edward’s University in Austin, Texas, not offered them to me, before he discarded them, none of this research would have taken place. 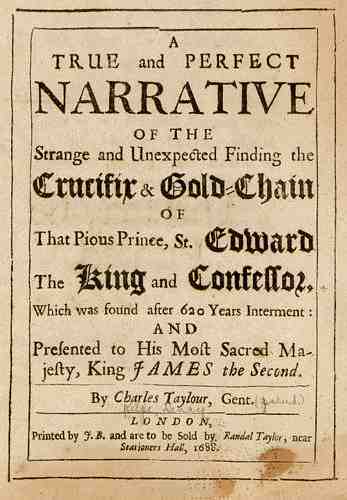 So I can relate to Charles Taylour and the happenstance way he was introduced to the Gold Crucifix and Chain. I was brousing the Notre Dame Library stacks looking for a book about its same size which I knew was stored on a particular shelf on the same floor. In reaching for Taylour’s 1688 booklet, instead, I discovered a rare book I would never have found otherwise. It not only tied into the research I was doing about Mary and the School Colors, it also sent me on an unexpected archival adventure. Finding this ancient book mysteriously forgotten in the Notre Library stacks prompted me to dig deeper than I might have to research St. Edward the Confessor, as well. He was not only Father Sorin’s Patron Saint but also his inspiration in naming the second university he founded, St. Edward’s University. It has been called, The Notre Dame of the South ever since. 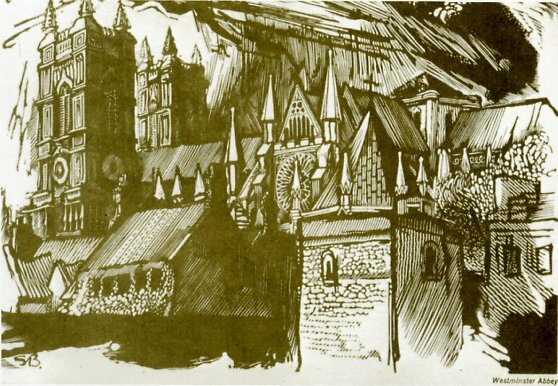 When Sorin was alive, the Feast Day of St. Edward the Confessor, October 13, was always a very special day, especially for the religious at Notre Dame. 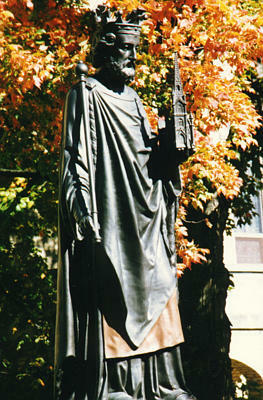 A statue of St. Edward resides in front of St. Edward’s Hall on the Notre Dame campus, former home of the minims, the grade school boys who attended Notre Dame. Note: The transcription of the story that follows was done as closely to the original as possible. All spelling, italics, capitalizations, and bold phrases and names (printed in Old English font) are also -- as much as is possible -- exactly as they were in the original. The last word at the end of each page, which is repeated as the first word on the next page -- which must have been the style at the time -- was on the right margin in the original and each paragraph was indented. If you take particular notice of the cover of the book, below, you will also see the Ss looks like Fs. Spelling was also very different then, which made it quite a challenge to transcribe. Of the Strange and Unexpected finding the Crucifix and Gold Chain of St. Edward the King and Confessor. Obligation to set forth this plain Narrative of the matter of Fact, from whom all others (tho never so Erroenous) pretend to have it. In order thereunto (to avoid confusion, prolixity, and what is worse, Tedious Prembles, and digressions) I shall take this short Method to perform it. In the first place, I shall give an account of some things previous (or what went before) in order to the discovery. Secondly, the description of the place it fell from whence these things were taken. Thirdly, the manner of finding and securing the same, the disposing thereof, and presenting them to his present Majesty. Fourthly, an Exact description of the said Crucifix and Chain with other dependencies thereon. All which (as heretofore) was likewise performed at the Solemn and Happy Coronation of our Royal Sovereign his present Majesty King James the Second, and his most excellent Comfort our Gracious Queen Mary, whom God grant long and happily to Reign here, and Eternally in Glory hereafter. for, who immediately took me along with him to Whitehall, that I might present this Sacred Treasure to the King; and being no sooner introduced into his Majesties Closet, (where I had the Honour to Kiss his Royal Hand) but upon my knees I delivered them with my own hands to him; which his Most Sacred Majesty was pleased to accept with much Satisfaction, and having given him a further account how the remains of the body of the Holy King was; and opened the Cross in his presence, I withdrew, leaving them safe as being now in his Royal possession. far as to oblige me with this short abstract from his large History of this Abby�s Memoires. thereof then bare chance or casualty. Bishop of Canterbury, and Alfric Arch Bishop of York on Easter-day following, in the Year of our Lord God, One Thousand Forty and Three; Granting unto the said Abby of Westminster that from thenceforth whensoever himself, or any of his Successors, Kings of England, should wear their Royal Diadems in that Church, that the Precentor of the same, should receive, at the hands of the Kings Sheriff, half a Mark of Silver, and the Covent One hundred Simnells, or Wastel-Cakes of the finest Flower, together with Sixty four Gallons of the best Wine, in Commemoration thereof. Action, on that day, the King made a most Royal & Magnificent Feast at his Palace at Westminster, where all comers and goers, as well Rich as Poor, were liberally treated or rewarded. Which Royal Feast and grand Solemnity was performed in the Year of our Lord, 1269. 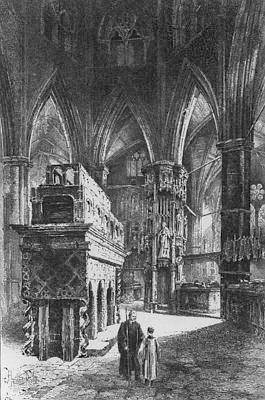 From this very time we have nothing on Record, that takes notice of any other removal or disposal of these Holy Reliques And therefore may conclude, they remained safe and undisturbed until the days of King Henry the Eight, when we find (in that General Inundation which swept away all things Sacred) this Noble Feretory stript of all its costly furniture, and the Body of its Golden-Case, to be meanly inclosed in a course Wooden Coffin; the same I presume I lately saw, and from whence I drew the so often-mentioned Crucifix and Gold Chain.